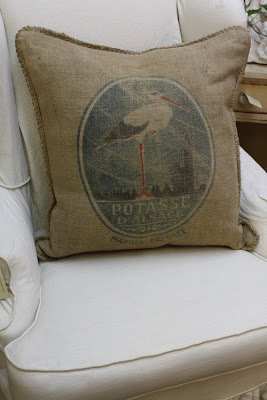 Making pillows, ottomans and upholstery from vintage grain sacks is the medium of choice for fabric artist Kym Fraser. 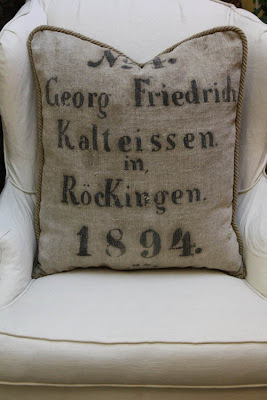 To celebrate the opening of her website and online store, 3 Fine Grains, Kym has teamed up with my pal Gina Milne to give away one of Kym's pillows through Gina's great blog, Willow Decor. The rules are pretty simple. Go to Gina's post from 25 March and leave a comment. That's it. Gina will select and announce a winner on Thursday, 2 April. 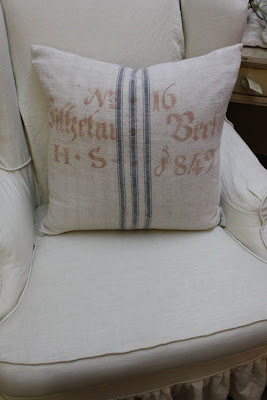 These vintage fabrics are the real deal, some of them are 160 years old --talk about character! Some of these are really fascinating too. This sack with the stork once carried lentils. 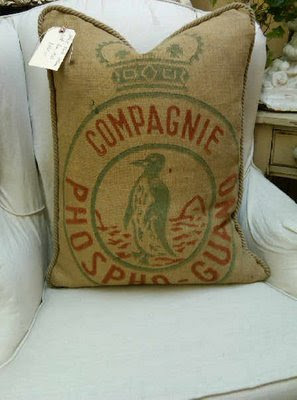 And as a pièce de résistance, this penguin sack once carried penguin guano. I need that penguin pillow for that reason alone. I've long been of the opinion that every object you own should have a story to tell. Man, that penguin sack could write an epic! 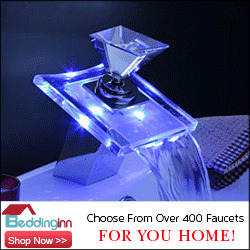 So go spend some time with Gina and Willow decor and leave her a comment. Even if you don't win anything, you'll see some great stuff and you'll learn a lot from Gina's research and design passions. These pieces are really unique and a great way to recycle :-) I'm on my way to Willow Decor right now!! Tell Gina I said hello! So sweet to post this!! Isn't that penguin pillow the best?! Thanks so much and good luck! love this so much!!!!! i want to steal your images. Steal away Joni! Do you know Kym? She's a Twitterer and a Facebooker. She's carries some amazing stuff and it's right up your alley. Reader question: What never goes out of style? Reader Question: New lighting in my kitchen? Not So Big Remodeling hits the shelves this week!